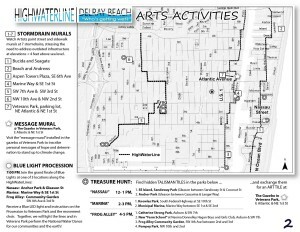 For the Delray Beach Earth Day Festival this year, neighbors from across the community will work to simultaneously draw a blue chalk line indicating impacts on the community by climate change induced sea level rise. 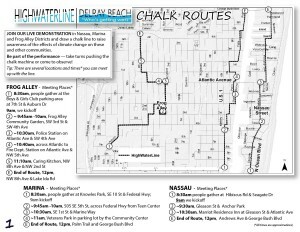 The 4-inch wide blue chalk line will be drawn with a sports field marker through the communities of West Settlers, Marina and Nassau Park, giving residents a chance to speak with their neighbors about the climate impacts in the region. From sea level rise impacting high tide related flooding, to rising water tables and subsequent flooding, Delray Beach is leading the region in taking measure to adapt – through one way flood valves to water retention areas. 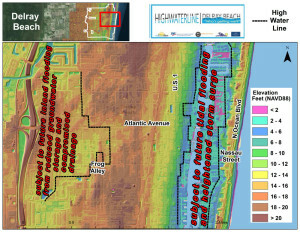 HighWaterLine | Delray Beach is a continuation of an international project which has brought awareness to climate impacts in New York City, Miami, Philadelphia and Bristol, UK. Images, maps and stories from New York City, Miami, and Bristol. 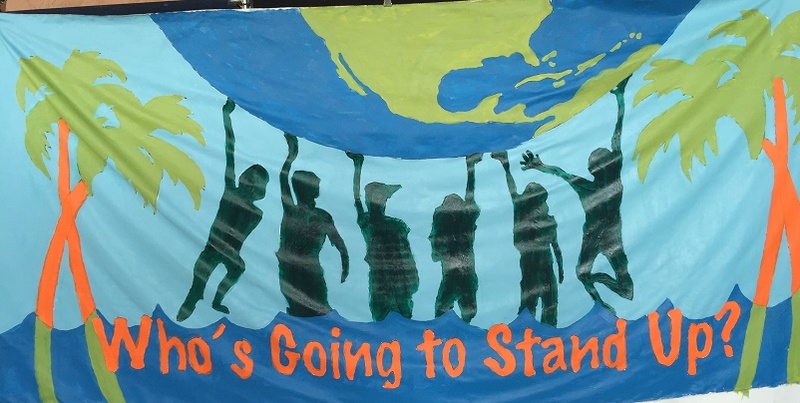 Participate in a choreographed movement choir expressing your determination to build community resilience in the face of climate change. Part of National Waterdance. Message Mural – by Sharon Koskoff and Plumosa Elementary School of the Arts Fifth Graders. Inscribe your thoughts on climate change and your hopes for resilience. The selected storm drains target specific sites with a history of increasing flooding, demonstrating the need for updated infrastructure and other resilience and mitigation strategies as rising sea levels and impacted groundwater overcome outdated storm water management systems. Map of locations. These important sites for citizen recreation and relaxation, key to Delray Beach’s famed rich quality of life, are under threat of impact by climate change effects, including increased height and frequency of flooding. For the parks along the water, additional potential damage can occur via climate change related storm surges associated with increasingly intense and frequent major storms. Parks inland will be affected by climate change flooding resulting from raised fresh groundwater levels due to sea level rise and sea water intrusion into the porous limestone bedrock beneath groundwater. This phenomenon will increasingly prevent stormwater to respond to gravity resulting in higher flood levels and increased subsidence time. April 25th beginning at noon, search for small bags with flags attached. In each bag hunters will find a small tile inscribed with a number, which, when returned to the Art Treasure Hunt center in the Veterans’ Park gazebo, will be exchanged for a 6”x6” tile with a design created by one of Delray’s participating artists. 48 tiles are in the collection to be awarded, echoing the 48 inches at which the HighWaterLine Delray Beach will be marked.